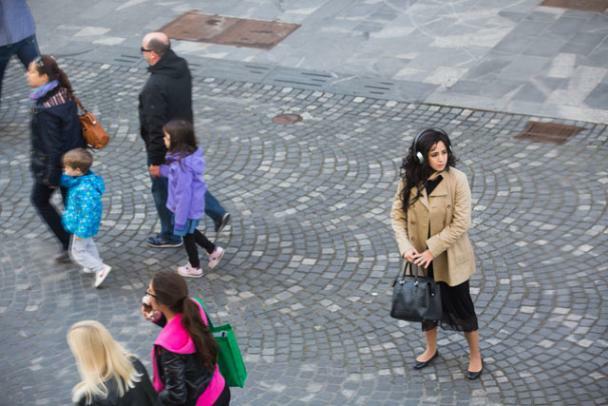 The set up is simple: A woman with a pair of headphones is walking on a pavement. In a house next to where she is walking, there are two people watching her from two windows in separate rooms, high above her. These people are a man and a woman. In this case the woman was me. The man was a German visiting Ljubljana. The woman on the street is always the performance artist, while the man and the woman change from performance to performance. The man has a headset with a microphone. He can communicate with the woman on the street. In the room next to him, the woman is also wearing a headset. But she has no microphone and can't communicate with the woman on the street. Two women with headsets without microphones, unable to communicate with anyone. One man, whose voice is heard by both of the women. He is supposed to choreograph the woman on the street - hence the title. The man does not know that there is a woman in the room next to him, who can hear what he is saying. He only knows that he can communicate with the woman on the street. This sounds very exciting. Anything could happen. But there is something that limits the possible outcome of this set up. There is a recorded voice that instructs the man what to do and say, although he is given a couple of alternatives to choose from. Sometimes the recorded voice interrupts him, forcing him to stop talking before he has said what he wanted to say. The woman on the street is finally walking away from the space below the windows, without any reason. The man in the room opens the window and tries to call her back, but she just walks away. I don't think this makes him feel better, as the title suggests. My role as the woman in the adjacent room is not pleasant. I'm not told that I will be excluded from the performance, and just have the role of a bystander. Not until I try and speak and find out that no one can hear me, do I realize that I'm excluded. I can't understand why I had to be there. The performance, the roleplay between the woman on the street/the artist and the man choreographing her, is completely independent of me and my thoughts while I'm watching what is going on. As a woman I know what it's like to be excluded since many years ago. I don't need to be given a lesson about that.